Grill up steaks, burgers and dogs for the entire family when you pack the propane-powered Coleman PerfectFlow Portable Grill. This durable, steel-crafted outdoor appliance includes a 180 sq. in. cooking surface with fully-adjustable heat - up to 11,000 BTU of cooking power. The WindBlock System and PerfectFlow Propane Pressure Control Technology keep the heat steady for consistent cooking. On calm days, the shields fold down as side tables for extra work space. When the meal is over, the porcelain-coated, non-stick surface and grease-management system with removable dishwasher-safe tray make cleanup simple and quick. 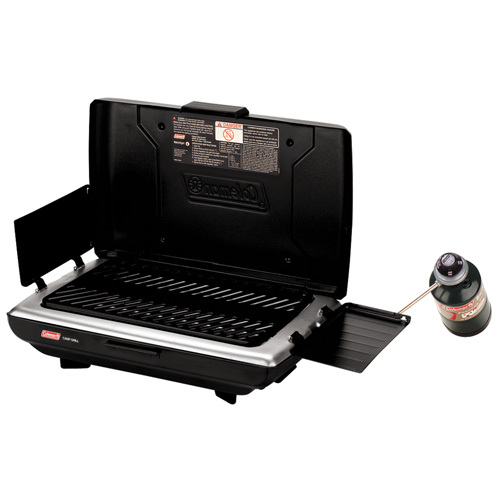 The grill is perfect for camping, hunting, tailgating and in case of emergencies. - Dimensions: 21" x 12.5" x 5.6"